Board a pontoon at the Horicon Marsh Boat Tour for a narrated tour through the "Little Everglades of the North". Relax as you learn about the history, the bird species, wildflowers and mammals that call this marsh their "home". Your next stop is at Confections for Any Occasion. This candy store is definitely a sweet success! Here you'll find the finest decadent chocolates, novelties, gourmet popcorns and unique hard to find candies. Joel, a blind chocolatier, will share the history of his shop, and will direct you in making your own chocolate. You may enjoy lunch at Confections for Any Occasion, or we can offer suggestions in the area. The 30-room mansion at the Historic Galloway House & Village was the "farmhouse" of the Galloway family for three generations. The hand-carved woodwork, etched glass and hand-stenciled ceilings are perfect examples of the marvels of the lifestyle from a bygone era. The grounds are home to 25 historic buildings including a country church, a one-room schoolhouse, a grist mill, and a log cabin. The Blakely Museum and CCC Barracks Museum also are on site. Complete today's tour with a stop at the Kristmas Kringle Shoppe. This two-story Bavarian-style building features a European street of shops, animated figures and 70 themed Christmas trees. 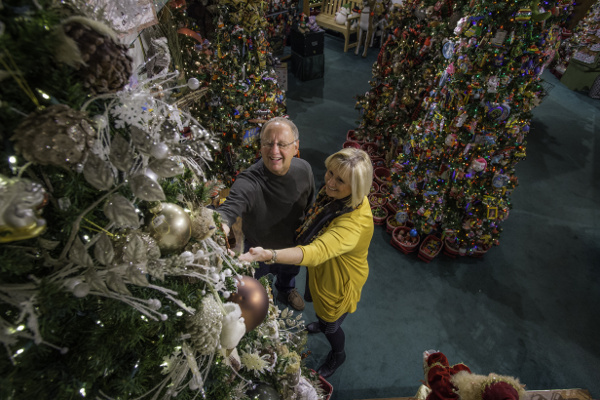 They offer many collectible lines, Italian ornaments and unique gifts including Fond du Lac souvenir lighthouses, ornaments and postcards. Check into one of our many fine hotels. We'll assist you with researching rates and availability. Freshen up before enjoying dinner at Sebastian's - a rare steak house very well done! Experience the Siberian Outpost where your adventurous group may visit with the dogs while learning about dog sledding and the history of an antique sled. Allow us to offer suggestions for a delicious lunch. Don't miss Larson's Famous Clydesdales, there's no show like it in the US! Experience the rich tradition of the Clydesdales and get a behind-the-scenes tour with exciting demonstrations and colorful displays in the 90-minute tour and show. Pet the beautiful Clydesdales and take photos of 16 champion Clydesdales including a RARE baby Clydesdale. Stop at Fond du Lac's 400 acre Lakeside Park located on the south shores of Lake Winnebago, Wisconsin's largest inland lake. Climb up to the 40-foot high observation deck of the lighthouse for panoramic lake views. This is a picturesque spot for a group photo! Dine at Sunset on the Water Grill & Bar on Winnebago Drive, specializing in steak, seafood, pasta, pizza and sandwiches. As the name promises, you'll be treated to a spectacular sunset! Treat your group to a unique breakfast experience at Schreiner's Restaurant, Bakery and Bernie's Pub featuring their famous scratch-prepared food and fresh bakery items in a casual and friendly setting. As you leave our beautiful area, head south and make a stop at Kelley Country Creamery. The farmstead creamery where the Kelley family turns their farm-fresh milk into premium farmstead ice cream offers over 300 flavors - 22 featured daily - sure to please everyone's taste buds! Rated Wisconsin's #1 Ice Cream Parlor by USA Today, and bestowed the "Best Ice Cream in America" designation by Good Morning America.